A service is an offer of value to another through a well-defined interface and available to a community (which may be the general public). A service results in work provided to one by another. Service Oriented Architecture (SOA) is a way of organizing and understanding ( representations of ) organizations, communities and systems to maximize agility, scale and interoperability. The SOA approach is simple - people, organizations and systems provide services to each other. These services allow us to get something done without doing it ourselves or even without knowing how to do it - enabling us to be more efficient and agile. Services also enable us to offer our capabilities to others in exchange for some value - thus establishing a community, process or marketplace. The SOA paradigm works equally well for integrating existing capabilities as for creating and integrating new capabilities. SOA ... is an architectural paradigm for defining how people, organizations and systems provide and use services to achieve results. SoaML ... provides a standard way to architect and model SOA solutions using the Unified Modeling Language (UML). 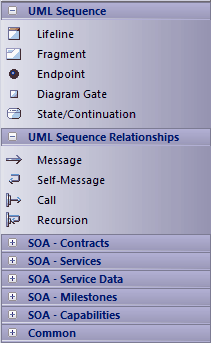 The profile uses the built-in extension mechanisms of UML to define SOA concepts in terms of existing UML concepts. ... the highest leverage of employing SOA comes from understanding a community, process or enterprise as a set of interrelated services and ... supporting that service oriented enterprise with service-enabled systems. SoaML enables business oriented and systems oriented services architectures to mutually and collaboratively support the enterprise mission. ... SoaML depends on Model Driven Architecture� (MDA�) to help map business and systems architectures, the design of the enterprise, to the technologies that support SOA, like web services and CORBA�. For further information on the concepts of SoaML, see the specification document on the OMG website SOAML document page. You can access the SoaML pages of the Toolbox through the More tools | SoaML menu option. There is a set of pages for each SoaML diagram type, although the last five pages in each set are the same. If you prefer not to use SoaML in Enterprise Architect, you can disable it (and subsequently re-enable it) using the MDG Technologies dialog (Settings | MDG Technologies).